Stepping into the gardens of the Shrine of the Bab is like entering a hallucination. They rise in steps all the way up the mountainside above Haifa's downtown, and at the midway point, at midmorning, the clear light off the Mediterranean combines with the precise efforts of 150 gardeners to achieve a combination of lucid depth and dazzling color. The glittering dome of the shrine hangs suspended above an immaculate park like the sun rising over an infinity pool. It radiates a sense of permanence. "It's kind of like a theme park, where they're keeping everything 'just so,' " says Jonas Mejer, 20, a student visiting from Copenhagen. "But it's a holy place." The shrine marks the resting place of the "Bab," or "Gate," the title given to Siyyid Ali-Muhammad in his role as prophet. Born in southwestern Iran, he announced that a greater messenger was coming after him and laid down some of the precepts of the new faith, such as equality for women and the renunciation of violence. He was executed as a heretic, his remains recovered by followers and moved covertly from place to place for decades. Their final resting place was decided by the messenger he heralded, Mizra Hussein Ali, known as Bahá'u'lláh, or "Glory of God." Sent into exile, he was taken to an Ottoman prison in Acre, across the bay from Haifa. He picked out the hillside where the Bab's remains are buried, though his own grave in Acre (which Israelis call Akko) is the one the world's over 5 million Bahá'ís face during prayers. 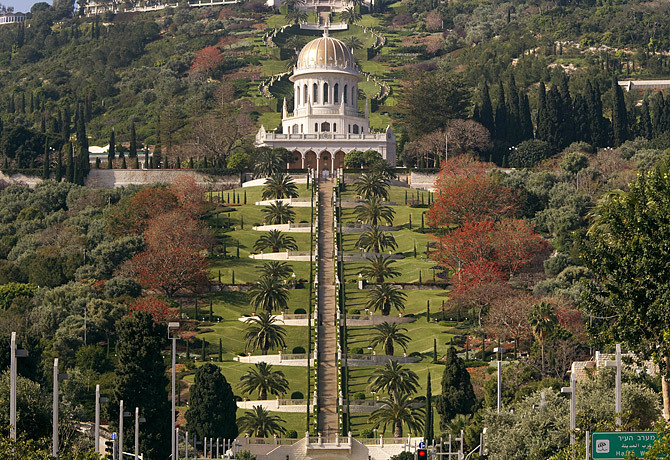 "When you explain the Bahá'í faith, people say, 'Well, that's just common sense,' " says Rob Weinberg, communications director at the Bahá'í World Centre, as the Haifa complex is known. It's a monotheism that embraces all major religions, positing that God enlightened humankind over the ages by sending prophets — Abraham, Zoroaster, Krishna, the Buddha, Jesus and Muhammad. The Bab and Bahá'u'lláh were the latest in the chain. Bahá'ís revere marriage, family, public service and both science and religion, since both seek truth. As noncontroversial as that may seem, it hasn't prevented Bahá'ís from being persecuted, mostly in Iran, where they are regarded as apostates. The problem is with the idea that the Creator sent a messenger after Muhammad, whom Muslims regard as the final word — "the seal of the prophets." The 300,000 believers who remain in the Islamic Republic routinely face discrimination and even arrest. Bahá'í youth who want to attend university must hide their faith because adherents are barred from higher education. Believers seeking solace from oppression can find it in the becalming brilliance of the Shrine of the Bab. Not that Haifa exactly teems with the faithful: last year the 760,000 tourists outnumbered Bahá'ís at the shrine by 100 to 1. (The largest concentration of Bahá'ís is in India.) 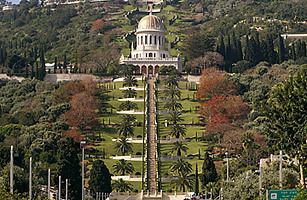 Still, Haifa is a good fit for the Bahá'ís. Its Jewish and Arab populations seem at ease with each other, and glad to have a third faith in their midst. "The shrine," said Mayor Yona Yahav at the reopening, "is the core and symbol of this tolerant and multicultural city." And indeed, from halfway up this exquisitely landscaped hill, there seems no safer haven.